Here is a brief description of the Medical Microbiology course for Allied Health majors. I have not taught this particular course for a few years now, so my syllabus is getting to be a bit dated. You should check with Dr. Ann Spain if you want a more recent syllabus. Introduction to the microbial world with an emphasis on human microbial disease mechanism and the basis of a protective immune response. The laboratory provides practical experience with fundamental techniques and instrumentation. Designed for students in allied health associate degree programs. Textbook: Microbiology: A Systems Approach, Third Edition by Marjorie K. Cowan and Kathleen P. Talaro. McGraw-Hill Companies. You may use older editions of the textbook if you wish; the page numbers for assignments will not correspond correctly, but you should be able to figure that out without too much trouble. Lab manual: We will be using online lab resources, handouts, and a printed laboratory course pack for the semester. Other supplies: Cloth lab coat and a marking pen (sharpie). Optional materials include a scientific calculator, a set of colored pencils and a wax pencil for the laboratory. These are available in the bookstore and are highly recommended. Microbial Diversity - Give examples of and compare and contrast different types of microbes (including viruses, bacteria, fungi, and protozoa) as well as identify various structures and define their functions. Assessed via the homework, laboratory quizzes, lecture exam questions, the laboratory practical, and the comprehensive final exam. Microbial Physiology - Explain the various metabolic strategies employed by microbes providing specific examples of how metabolism is linked to environmental cycling of elements and pathogenesis. Describe basic concepts involving how genetic information flows in microbial cells, detailing the importance of mutation, recombination, and lateral genetic exchange in virulence. Antimicrobials and Immunity - Distinguish between chemical, physical, and biological means of controlling microbial growth. Decide which means would be most appropriate when given a hypothetical scenario. Summarize and diagram the interrelated systems of the host immune defenses, differentiating between the innate, humoral, and cellular defenses and identify points of interaction. Explain how inappropriate immune responses can result in host damage. 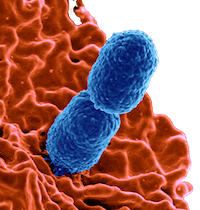 Microbial Diseases - Identify microbial pathogens and correlate them to the diseases that they cause. Describe several different molecular strategies employed by microbial pathogens and give several specific examples of each. List the most important microbial diseases in the U.S. or worldwide. Assessed via laboratory quizzes, the laboratory task book, the unknown project, and the laboratory practical. Communication - Demonstrate an ability to work in group settings and exchange ideas concerning course-related topics. Read, write, and speak about Microbiology with classmates and members of the community. Assessed via the study guides, reflective learning journal, and unknown project. Assessed via the study guides, reflective learning journal, post-exam bonus assignments, and class surveys.